There’s now a white-painted bike on Central Park West where cyclist Madison Lyden was run over and killed because a taxi driver parked in a bike lane and forced her into traffic. There’s also a resolve that it never happen again. 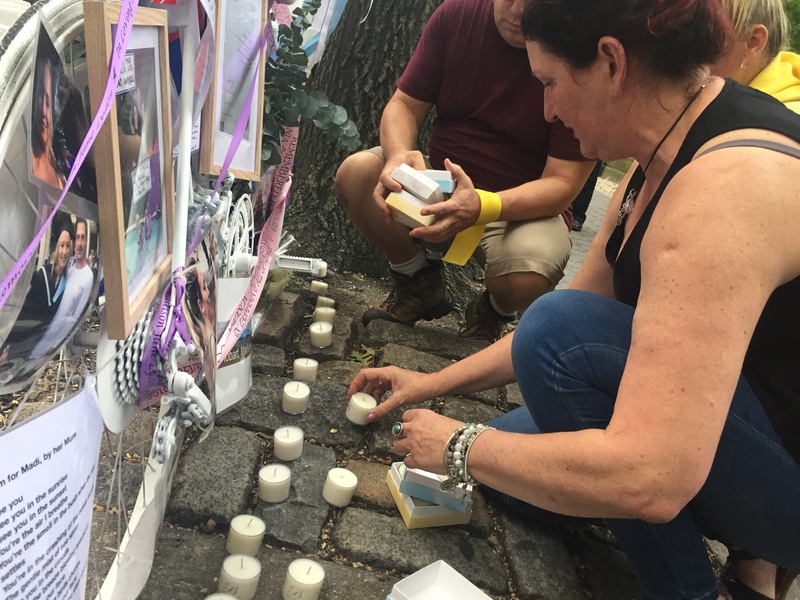 More than two dozen street safety advocates gathered at the site of the Aug. 10 killing that shocked only those who weren’t paying attention to the daily violence that plays out on New York’s meanest streets — and the years of activism calling for a protected bike lane near the very spot where the Australian tourist died. “I know the healing this will do, for a family that’s seen such deep grief,” said Lyden’s friend Carolyn Bischof, as she pointed to items festooned on the so-called “ghost bike”: Lyden’s diploma, photos of her home and friends down under, a strand of Bischof’s favorite horse’s hair. Lyden’s friend Carolyn Bischof lit a candle at the dead woman’s memorial. Change has been in the Upper West Side air since Lyden’s death under the wheels of a truck after cabbie Jose Peralta cut her off and then blocked her way. The commander of the 20th Precinct said he wanted to charge Peralta for his role in the death, but Manhattan District Attorney Cyrus Vance Jr. declined. So it falls, once again, on the activists to demand change, which only seems to come after a high-profile death. Many deaths on Queens Boulevard led to a protected lane there. The 2017 death of Gelacio Reyes on 43rd Avenue in Sunnyside led to one there, too. And the killing of two small children on Ninth Street in Park Slope in March led to a pair of protected lanes that were just installed last month. Since Lyden’s death, Upper West Side Council Member Helen Rosenthal has called for a protected lane alongside one of the world’s great urban parks, which is currently lined by car storage, speeding cars and buses. Community Board 7 has demanded a design this year. Since 2012, over 430 people were injured on Central Park West, including 113 cyclists, according to city data compiled by CB7 member Richard Robbins. But the issue of protecting cyclists on Central Park West will likely come down to what it often comes down to: a car-owning minority demanding virtually free access to the public curb to store their private vehicles. One of these days a car or a bus will just lose control of their vehicle and run over a family (with a stroller) crossing in and out of Central Park. And the result? Blood all over the street, dead bodies and just a traffic ticket for the offending driver. At the very least, they should make Central Park west (park side) no parking at all. NYC is a pedestrian city first and should not cater to the whims the car-owning minority. If you own a car, you should be able to afford parking it in a garage. Bill de Blasio doesn’t care about dead people if they’re on a bike. Especially if it means he might have to remove parking. Simple as that. The issue I’ve seen, in the mornings, is drivers northbound looking to turn left onto 91st Street would get caught waiting for a break in southbound traffic, unable to turn on their green. The next phase of the light is red for north- and south-bound traffic, walk-sign for pedestrians in all three crosswalks. Instead of the 1 or maybe 2 drivers who’d actually gotten caught in the intersection taking this opportunity to clear it, though, you’ll often see 3 or 4 drivers bang a left turn through, on their red light, across 2 now-active pedestrian crossings. It’s maddening. And of course the only police enforcement I’ve ever seen on CPW is cops ticketing cyclists for riding across the tops of the T intersections on the east side of the avenue. P.S. 84 doesn’t have quite the same number of East Side kids being dropped off by their chauffeurs. Mystery Solved: DOT Finds Madison Lyden’s ‘Ghost’ Bike — In Its Own Warehouse! The bike, which the city removed ahead of last week's Macy's Thanksgiving Day Parade, had been missing for 10 days.